"A grilled peanut butter and chocolate sandwich. We used to make these camping in a pie iron over a campfire. It was one of our favorites. Modified it for home." Spread 1 teaspoon of margarine onto one side of each slice of bread. Put the margarine sides together. This is to keep from getting margarine on your hands when spreading peanut butter. 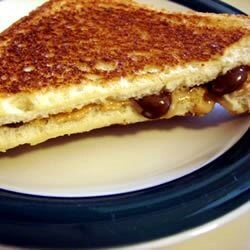 Spread peanut butter over one slice of bread, and sprinkle chocolate chips onto the peanut butter. Remove the other slice of bread from the back of the peanut butter slice, and place margarine side out over the peanut butter and chocolate chips. Place a skillet over medium heat. Fry sandwich until golden brown on each side, 2 to 3 minutes. Cool slightly before cutting in half. A local restaurant makes a similar sandwhich that I crave often. It has Nutella, PB and marshmallow creme toasted between white bread. It's sort of like a s'mores without the campfire. Delicious! A wonderful and easy to make treat! Instead of the margarine, I sprayed the bread with butter flavored cooking spray and cooked on low heat until it started to get brown. OMG!!! This sandwich is SOOOOO good! It is best when used with Texas toast and real chocolate chips. Nice sandwich. I used milk chocolate chips instead of semi sweet. I was craving something sweet and this hit the spot. I would definately eat this again.